The 005 and 012 cone tweeters are made by Peerless in Denmark. They both look identical except the 005 tweeter is 16 ohms and the 012 is 8 ohms. They are Peerless model MT-225. The impedance is stamped in white ink on the front of the cone of some production tweeters. An alnico magnet is glued to a U-shaped yoke that is welded to the front plate of the magnet structure. The cone/coil assembly is very lightweight and doesn't even have a spider to center the voice coil. The cone is paper. The thin aluminum center dome weighs only 0.010 grams and radiates out to 20kHz. The positive terminal is indicated by a red insulating washer shown on the left side of the tweeter. After the tweeter is tested, a McIntosh label is attached to the back of the magnet structure. The part number is at the top and the date code is at the bottom. The numbers 73 03 indicate the third week of 1973. The tweeters can be used interchangeably in the ML systems despite the difference in impedance. The measured acoustic response for either tweeter is identical from 7kHz to 20kHz using the same crossover. Electrically, the crossover is above 10kHz. 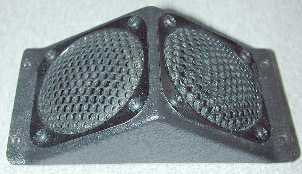 The new polypropylene-cone tweeter was introduced in 1993 and replaced the MT225 paper cone tweeter. The Peerless catalog number for the 8-ohm version is 801730. There are several important differences. The output level is about 2 dB lower. The mounting holes are the same as the MT225. Due to the rounded basket, the mounting hole is 2-1/4” in diameter. 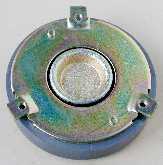 The ceramic magnet diameter is 1-5/8”. The terminals are very close to the edge of the mounting hole. The cone, surround and dome are all made of polypropylene. The magnetic gap contains Ferrofluid. 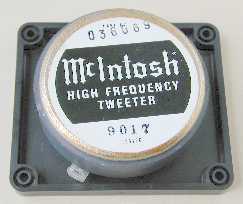 This tweeter was never used in McIntosh systems and may no longer be available. Another alternate tweeter was the Matsushita EAS-5PH31S but is now, in 2011, likely discontinued as well. The 2-1/2" cone tweeter is made by Peerless in Denmark. It is identified as the Peerless MT-25. An alnico magnet is glued to a U-shaped yoke that is welded to the front plate of the magnet structure. The cone/coil assembly is very lightweight and doesn't even have a spider to center the voice coil. The cone is made of paper. The thin aluminum center dome weighs only 0.010 grams and radiates out to 20kHz. 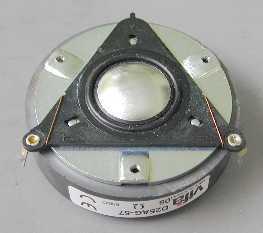 This tweeter is used in the XR-3, XR-5 and XR-7 speaker systems. They are used in multiples to increase power-handling capacity. The square frames allow close placement. The XR-3 and XR-5 systems have two tweeters mounted in an angled plastic piece that mounts on the surface of the front panel. 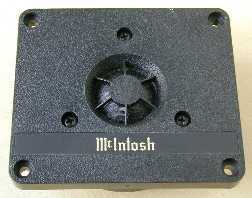 McIntosh made the perforated covers from perforated stock. They were stamped out, painted black and glued to the perimeter of the tweeters to protect to the cone and aluminum center dome. The XR-7 has an array of four tweeters mounted in a circular array to preserve good high frequency dispersion. The tweeters are connected in series parallel. Impedance is 8 ohms. Size is 2-5/8" square and 1-1/2" deep. Weight with the cover is 143 grams or about 5 ounces. 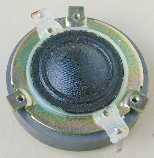 This is a round soft fabric dome tweeter made by Philips. It is the AD 0163-T8. This new tweeter has much higher power handling and better dispersion than the Peerless cone tweeters. The tinsel leads are not coated. There is no coating under the dome. It is used in the XR-14 and XR-16 speaker systems. 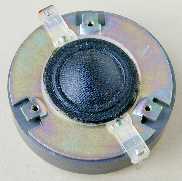 This soft fabric dome tweeter is made by Philips. It is similar to the round AD 0163-T8 but is custom made for McIntosh. It is improved over the 053. The tinsel leads are coated to damp a mechanical resonance. It is like the 069 tweeter but there is no coating under the dome. 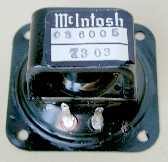 A McIntosh part number label is added to the back of the magnet structure after it has been tested. The tweeter is 3-11/16" X 3-1/8" and 1-1/4" deep. It is used in the XR19 and XRT20 speaker systems. 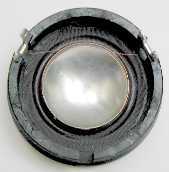 This soft fabric dome tweeter is made by Philips. It is similar to the round AD 0163-T8 but is custom made for McIntosh. It is improved over the 053. The tinsel leads are coated to damp a mechanical resonance. There is no coating under the dome.A McIntosh part number label is added to the back of the magnet structure after it has been tested. The tweeter is 3-11/16" X 3-1/8" and 1-1/4" deep. It is used in the XL-1, XL-10 and XR1051 speaker systems. See the 036-069 tweeter for a complete description. This soft fabric dome tweeter is made by Philips and is similar to the round Philips AD 0141HE-T8 but is custom made for McIntosh. The rectangular shape is custom made for Mcintosh. This allows closer spacing of the tweeters then used in multiples for the column systems. The black plastic front plate has a phasing disc in the center that smoothes the response, improves directionality and also protects the dome from being damaged. A recessed area near the bottom is for an aluminum silk-screened decal with the McIntosh name in gold lettering. The soft dome, voice coil, tinsel leads and terminals are one subassembly called a "butterfly." The tinsel leads are brought out to terminals on either end of the subassembly. Some versions had solid wire instead of tinsel wire. A red mark can be seen on the upper left part of the assembly that indicates the positive terminal. The fabric of the dome and surround has a black colored coating to seal the interstices of the material. A second custom coating under the dome was made only for McIntosh. This completely damps out the fundamental resonance. Two holes in the butterfly locate with pins on the magnet structure. These assemblies are interchangeable and a damaged butterfly assembly can be easily replaced by removing three screws from the front plate and adding the new one. The rainbow colors are from the plating process. 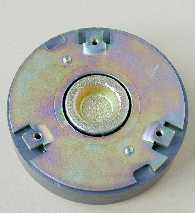 The magnet assembly is made of three parts. The back plate and pole piece is made from one piece of cold formed steel. The magnet is barrium ferrite. The front plate is stamped steel. The two locating pins and three screw holes can be seen in the picture. The center of the pole piece is recessed for an increased air volume behind the dome. We sampled a version using Ferrofluid in the magnetic gap. This raised the resonant frequency and limited the useful low frequency response of the tweeter and that was not acceptable. Later, we found that the ferrofluid had dissolved the adhesive that held the voice coil to the dome assembly. The problem was said to have been corrected by Philips in later production. Ferrofluid is a mixture of finely ground magnetic particles suspended in a viscous fluid. It is kept in place by the magnetic field in the gap. It is used to keep the voice coil temperature down and transfer the heat to the magnet structure. It was not used with this tweeter or any other tweeter until 1993, starting with the 036-095. A McIntosh part number label is added to the tweeter after is has been tested. The tweeter is 3-11/16" X 3-1/8" and 1" deep. Weight is 262 grams or about 9.2 ounces. It is used in the XRT18 and XR290. This tweeter was no longer used for designs made after 1992. This soft fabric dome tweeter is made by Philips and is similar to their model AD 0163HE-T8 round tweeter but is custom made for McIntosh. The rectangular shape is custom made for Mcintosh. This allows closer spacing of the tweeters then used in multiples for the column systems. A McIntosh part number label is added to the tweeter after is has been tested. The part number is at the top and the date code is at the bottom. The numbers 90 17 indicate the seventeenth week of 1990. The tweeter is 3-11/16" X 3-1/8" and 1-1/4" deep. Weight is 531 grams or about 1.17 lbs. It is used in the XR-17, XRT22, XR230, XR240, XR250 and XR1052. This tweeter was no longer used for designs made after 1992. 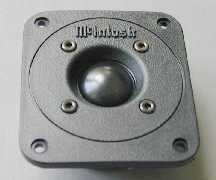 This soft dome tweeter is made by Cotron in Taiwan. It was used in the early version of the XD715 and XD717 systems. This tweeter was later replaced with the Philips 036-069 tweeter that was more reliable. This tweeter is made by Seas in Norway. 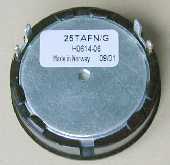 It is their H 614 model 25TAFN/G rated at 6 ohms. 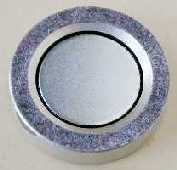 The magnet structure is very small and contains a neodymium magnet. The dome is made of aluminum. A perforated grille protects the dome and supports a 1/2" transparent phasing disc stuck to the center of the inside. A screw and rear bracket are used to hold the tweeter in place. The hole for the screw is in the center of the back of the tweeter. A shoulder near the front of the plastic piece keeps the tweeter in place. The tweeter is 1-7/8" in diameter and 11/16" deep, not including the solder lugs. It weighs 87.5 grams or about 3 ounces. It is used in the McIntosh HT1, HT4, HT4 THX, and SL6. Ferrofluid is used in the magnetic gap. Ferrofluid is a mixture of finely ground magnetic particles suspended in a viscous fluid. It is kept in place by the magnetic field in the gap. It is used to keep the voice coil temperature down and transfers the heat to the magnet structure. The fundamental resonance is at 1.8 kHz. A felt ring is used between the metal magnet structure and the plastic front piece that contains the dome/voice coil assembly. This prevents vibration between the two pieces. The surround is made of textile material that is glued to the voice coil and aluminum dome. The surround is curved towards the front of the dome. The voice coil leads can be seen at the upper right and left. They are dressed across the surround and to the terminals mounted on the plastic shell. The magnet structure snaps in place inside the shell and is held by tabs at the rear of the shell. I have found a set of three of these tweeters used in a McIntosh SL6 speaker system that have the output reduced to almost zero. The system was driven by a 90-watt amplifier that may have been driven into clipping. The SL-6 has no driver protection circuits. The measured DC resistance of each tweeter is correct but there is no impedance rise at the fundamental resonance of about 1800Hz. This characteristic can be found with a "frozen" voice coil or a demagnetized magnet. The voice coil is in like new condition with no evidence of overheating, bubbling or warping. The magnetic gap is filled with Ferrofluid that appears to be still in liquid form. However, analysis by Seas has found that the ferrofluid has turned to black sludge caused by long-term exposure of the fluid to high temperatures. This is sufficient to prevent the voice coil from moving and resulting in no output. Compared to the Philips 069 tweeter used in earlier McIntosh systems, a new 095 tweeter averages about 6 dB less output for the same voltage input despite the lower 6-ohm impedance. This means the 095 tweeter must be driven with 4 times the power for the same listening level. Ferrofluid is not used in the 069 tweeter or any other McIntosh driver prior to 1993. Here are response curves for two of each version of this tweeter. The red curves are aluminum domes McIntosh 036-095 (Seas H614) and the green curves are the soft fabric domes (Seas H615). The tweeters are identical except for the dome material. The curves for aluminum are typical for this material. A very pronounced resonance of over 15dB can be seen near 27 kHz. This resonance may contribute to the characteristic sound of aluminum material. Although we don't hear this high, subharmonics of 27 kHz in program material can excite this resonance. When combined with other frequencies in program material, the result can be intermodulation distortion products that are audible. Of course, if the equipment used to test these tweeters only goes as high as 20 kHz, then the resonance will not be revealed. 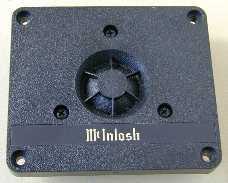 Starting in 1993, aluminum dome tweeters were used for the first time at McIntosh. This is also the first time Ferrofluid material has been used with any of the McIntosh drivers. The comments about this change are my opinions based on engineering facts and do not include the reasoning for any marketing strategy that may have been involved at that time. Aluminum domes were discontinued in 2001 starting with the Academy series of speakers. The 095 tweeter was used in the McIntosh HT-1, HT-4, HT-4THX and SL-6 speaker systems. 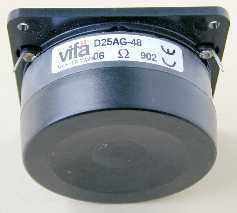 The 096 tweeter is made by Vifa in Denmark. It is similar to the stock D25AG-57 but the plastic front plate is custom made for McIntosh. A U-shaped raised area has the name McIntosh molded in it at the top. The dome is made of aluminum. Plastic rings and supports protect the dome. A phasing disc is located in the center. The dome, voice coil and terminals are built on a triangular plastic subassembly. Three holes in the subassembly are located on three raised pins on the top plate. This insures proper centering in the gap. 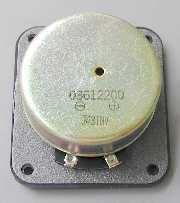 If the voice coil or dome is damaged, a new subassembly can be easily installed. The three screws holding the plastic front plate can be removed with a star shaped Alan wrench. The subassembly can then be lifted off. Here's a picture of the pole piece and magnetic gap where the voice coil is placed. Ferrofluid is used in the gap and can be seen as the black ring in the picture. Ferrofluid is a mixture of finely ground magnetic particles suspended in a viscous fluid. It is kept in place by the magnetic field in the gap. It is used to keep the voice coil temperature down and transfer the heat to the magnet structure. The pole piece is hollow in the center and provides an increased air cavity behind the dome for a low resonance of 1.2kHz. 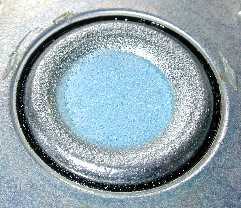 A piece of blue acoustic foam is inserted to reduce the amplitude at resonance. Before inserting the tweeter in the cabinet, a ring of foam tape is attached to the back of the plastic plate. This insures an acoustic seal to the cabinet for the woofers. 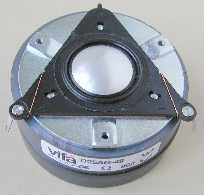 The tweeter is 4-1/16" in diameter and 1-1/8" deep. It weighs 504 grams or about 1.1 lbs. The impedance is 6 ohms. 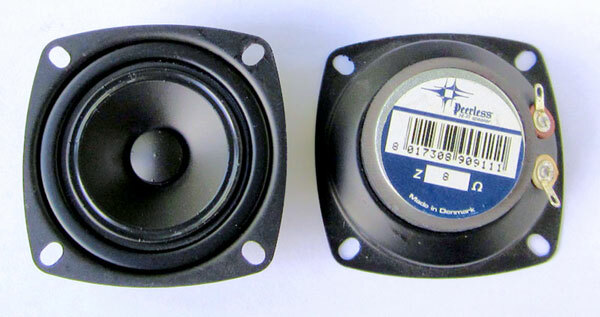 The 096 tweeter is used in the LS310, LS330, LS350, SL4, HT-3W and WS220 systems. Compared to the Philips 069 tweeter used in earlier McIntosh systems, this one averages about 4 dB less output for the same voltage input despite the lower 6-ohm impedance. Here is the response for this tweeter above 20kHz. 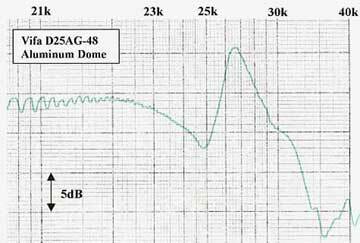 Aluminum domes typically have a very pronounced resonance above 20kHz. Here there are two pronounced peaks. One is at 23kHz and the other is at 27.5kHz. These resonances may contribute to the characteristic sound of aluminum material. Although we don't hear this high, subharmonics of 27 kHz in program material can excite this resonance. When combined with other frequencies in program material, the result can be intermodulation distortion products that are audible. Of course, if the equipment used to test these tweeters only goes as high as 20 kHz, then the resonance will not be revealed. 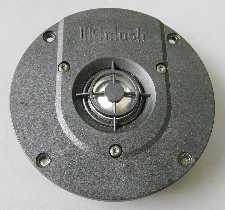 Starting in 1993, aluminum dome tweeters were used for the first time at McIntosh. This is also the first time Ferrofliud has been used in any McIntosh driver. The comments about this change are my opinions based on engineering facts and do not include the reasoning for any marketing strategy that may have been involved at that time. 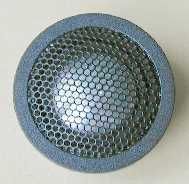 Aluminum domes were discontinued in 2001 starting with the Academy series of speakers. See a comparison on this page between Aluminum Domes VS Soft fabric Domes. 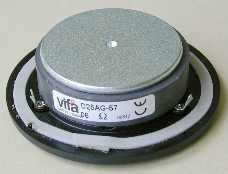 Aluminum domes were discontinued in 2001 starting with the Academy series of speakers. This tweeter is made by Vifa in Denmark. It is model D25AG-48. The square black plastic plate allows close tweeter spacing for use in the column systems. The dome is made of aluminum. Plastic rings and supports protect the dome. A phasing disc is located in the center. The pole piece is hollow in the center and provides an increased air cavity behind the dome for a low resonance of 1kHz. A piece of acoustic felt is at the bottom of the cavity to reduce the amplitude at resonance. Polarity marks are molded in the underside of the front plate near the terminals. The left terminal in the picture is plus. The tweeter front plate is 3-1/16" square and 1-9/16" deep. It weighs 503 grams or about 1.1 lbs. This tweeter is used in the XRT24, XRT25, XRT26 and XRT26J systems. Compared to the Philips 069 tweeter used in earlier McIntosh systems, this one averages about 5 dB less output for the same voltage input despite the lower 6-ohm impedance. Here is the response for this tweeter above 20kHz. 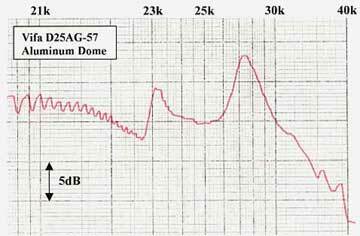 Aluminum domes typically have a very pronounced resonance above 20kHz. This one is at 26.5kHz. The resonance may contribute to the characteristic sound of aluminum material. Although we don't hear this high, subharmonics of 27 kHz in program material can excite this resonance. When combined with other frequencies in program material, the result can be intermodulation distortion products that are audible. Of course, if the equipment used to test these tweeters only goes as high as 20 kHz, then the resonance will not be revealed. 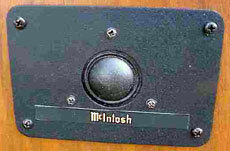 Starting in 1993, aluminum dome tweeters were used for the first time at McIntosh. This is also the first time Ferrofluid has been used in any McIntosh driver. The comments about this change are my opinions based on engineering facts and do not include the reasoning for any marketing strategy that may have been involved at that time. 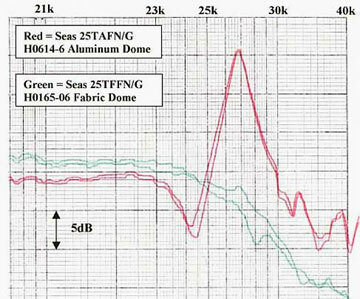 See a comparison on this page between Aluminum Domes VS Soft fabric Domes. Aluminum domes were discontinued in 2001 starting with the Academy series of speakers. 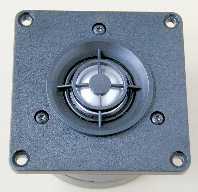 This soft fabric dome tweeter is made by Tonegen in Japan. The black plastic front plate is custom made and the name McIntosh is molded in it at the top. The tweeter is magnetically shielded so that it can be used near a TV set without distorting the picture or the color. A foam pad is under the front plate that will make an air seal with the cabinet. The front plate is 3-1/8" wide and 3-3/8" high. The dome is located off center near the top. Depth is 1-3/8" and weight is 440 grams or about 1 lb. 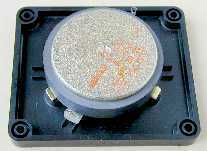 This tweeter, along with the 036-123 woofer, is used in the DDS-01 Karaoke speaker system made for sale in Japan. The system has been discontinued and many of the tweeters and woofers have been sold on the surplus market.